Our Polyfilm Greenhouse is covered with a 6 mil, 4 year polyfilm. The polyfilm is UV protected. The film is available in clear (80% light transmission), or white (55% light transmission). Simple assembly makes it a snap to get growing. The frame is made of galvanized steel. The insulated door has a built in shutter for extra ventilation. This door also comes with a keylock and measures 27″ x 72″. The peak height is 8′. The sidewall is 5′. This greenhouse has 3 runs of purlins for additional strength. 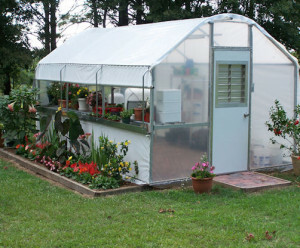 This greenhouse is Made in the USA. 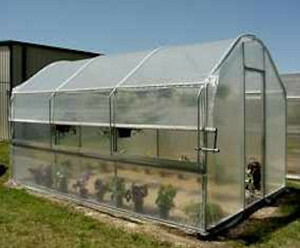 Looking for greenhouse polyfilm? Find it here. Looking for reinforced greenhouse polyfilm? Find it here. There is a one year limited warranty on the frame. There are many options available with this greenhouse. We suggest the roll- up curtain for added ventilation, even in areas where there is no electricity available. This optional item is shown in both of the pictures above. The polyfilm greenhouse is excellent for growing vegetables, starting seedlings, overwintering plants, growing bonsai plants, etc. 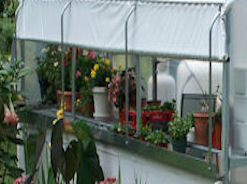 The Polyfilm Greenhouse Roll Up Curtain is optional. This is excellent for additional ventilation even in areas where there is no electricity. 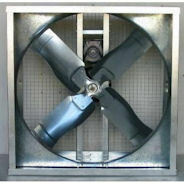 This optional box fan will supply additional ventilation for your Polyfilm Greenhouse. 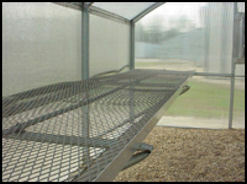 This 2′ wide stationary bench is available with the Polyfilm Greenhouse. Optional 11′ Roll up curtain $480.00 Add to Cart, This is for 2 sides. Ships by truck. You are responsible for unloading. Optional 16′ Roll up curtain $563.00 Add to Cart, This is for both sides. Optional 27′ Roll up curtain $884.00 Add to Cart, This is for both sides. We will not authorize a power lift gate, unless you agree to the additional charge. This is usually somewhere around $100.